What to do on maps. Simple gameplay tactics, a description of the goals in the current levels. Control points. in 2/3 maps you vie for control, of a space. The more of your side is in the space the faster control shifts in a very linear fashion. 2 bad guys 3 good guys means you gain control at +1 speed. 3 good guys alone you gain at +3 speed. This is the first map you play on and has 2 bases on opposite sides. 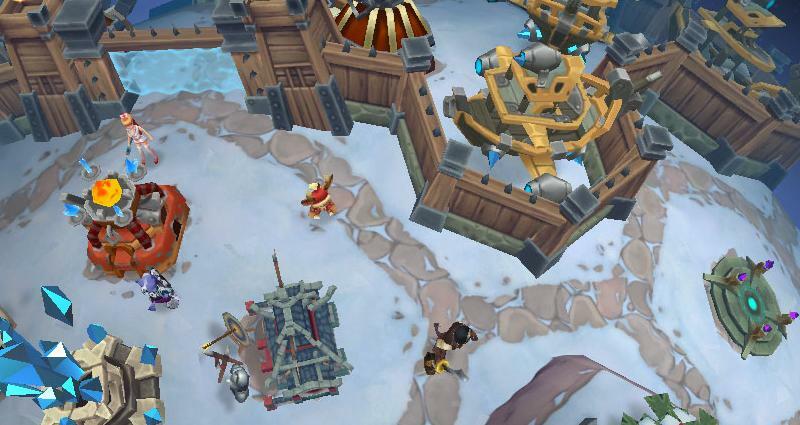 Each side has a main tower defended by 2 secondary towers with some control points in between each teams zone. The goal is to destroy the enemies main tower before they destroy yours. The control points spawn little critters that do a reasonable amount of damage, and provide a target for the tower defense to pay attention to while you attack the tower. The simplest way to win is to control the spawn points and keep them fully owned (all 5 blue lights). slightly more advanced is to use the cover of the seigelings to attack the tower while defending your control point. This is the second map, and has 2 carts with rockets on them heading to launch pads at the north and south portions of the map. This map becomes a little more about timing. Each rocket does 10k dmg to a statue, if you control both rockets when they launch thats a 20k dmg round. Your Statue starts with 55k health so there should never be more than 5 launches in a game. When you are not otherwise busy throw a little dmg at the enemy statue till you have done more than 5k to it. Basically hold onto a cart, gang up on enemies in 2v1 and 3v1 matches try to time the carts to get ahead by 1 round then hold 1 side the rest of the match. it takes a little feel not to kill all the enemy off at the wrong time, stay healed, be able to stall, dmg their statue, defend yours etc. This is the 3rd map you open, it is capture the flag with mobile bases. Take the flag from their turtle to yours. Once you pick up the flag you are extra slow, and everyone is trying to kill you... so be ready. To return a flag to base kill the flag carrier, and then touch the dropped flag. If they have your flag you have 2 jobs, steal theirs so they cant capture, kill their flag holder so you can capture.